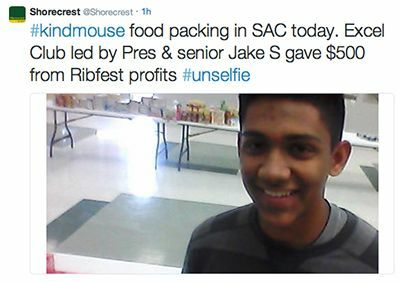 When my friend Sarah M., also a senior and a trained Pack-a-Sack veteran, introduced our school to the Kind Mouse Nibbles program, I did not fully understand the scope of the problem of childhood hunger or the need for the weekend food bag programs. Last year, the Excel Club voted to designate $500 from the club’s funds raised through working at the Ribfest corn booth for the weekend food bag program. With the guidance of our club advisor and service director (my mom, Su Stevens), we made plans to use the all-school Fall Food Drive as the vehicle to get the entire school community involved in contributing items for the weekend food bags. The 2014 Fall Food Drive kicked off on Nov 1, but it was a slow start as the seniors were still celebrating our Homecoming Class Competitions win and the rest of the Upper School was still playing catch-up after a week of focus away from academics. The rest of the school got a head start before we got thoroughly organized. Students of The Experiential School and Lower School received a flyer to take home explaining the collection drive including a shopping list on the back with photo examples of the items we were collecting. Alpha - Grade 4 students started bringing in items almost immediately. The Middle School devoted their CPR discussions to the issue of food-insecurity during the week of Nov 17. In each advisory group, they shared with each other what they learned about the topic and the startling statistic that 9,000+ school children live in food-insecure homes in Pinellas County alone. Each advisory received a Publix paper grocery bag with the shopping list, quietly challenging each group to fill the bag before Thanksgiving break. On Nov 17, three of the four service clubs represented by Sarah M. (Interact), Kylie A. (Key) and me (Excel) made a brief presentation to the Upper School at the Monday Morning Meeting. It just so happened to be the day when no fewer than five different groups, including a student-led service-learning project from Berkeley, presented various service appeals including the all-school Holiday Gift Drive kicking off on Dec. 1. We were worried that our efforts would be lost in the season of thanks and giving when everyone’s good cause is vying for everyone’s generosity. With Mrs. Craft’s help offering research and resources, the Upper School devoted its Advisory discussions on Tue. Nov. 18 to the topic of food insecurity. Each Upper School Advisory also received a Publix paper grocery bag to fill. We enlisted the help of the staff and administrators on campus, as well. Administration, Admissions, Business Office, Advancement, Technology, Library/TLC, Facilities, and Athletics all received a bag to fill. Our CFO Karen Moore also challenged the vendors, such as SAGE dining services and CIS security, to participate. Because of an enthusiastic and early response from the youngest students at our school, we held a packing day in the Student Activity Center on Nov 19. Gina Wilkins from the Kind Mouse Nibbles program, with whom Shorecrest parterened for the weekend food bags, spent the day with us. We collected all of the donations from all over campus and sorted and organized the items in the Student Activity Center. Upper School students trickled in during Community Time and free periods and by the end of lunch, we had packed 105 bags. Each bag contained ten single-serving, easy-to-open, no-preparation-needed items: a carton of shelf-stable milk; a juice box; a can of vienna sausages or pasta with meat; a fruit or applesauce cup; a pudding cup; single-serving cup of peanut butter; a package of crackers; a granola bar; a box of raisins; and a individual-service size box, cup or pouch of breakfast cereal. All items were put into a Publix plastic grocery bag and double-knotted. The drive ended on Nov 21, before we left for Thanksgiving break. Sarah and I rode around campus in a golf cart, collected all of the donations, and moved them to the service-learning room which was overflowing with bags and boxes of food donations. Over break, I helped sort, box, and count the number of each item so that we could plan for another packing day and purchase any items that needed to be supplemented. We used the contribution from the Excel Club to purchase mostly shelf-stable milk, cans of vienna sausages, and peanut butter. Sarah had told me from her past experiences with Pack-A-Sack at the First United Methodist Church that those are the same items that donors shy away from buying. We held another packing day on Dec 5 in the Landy Hall Lobby. With our Senior Class Sponsor Mr. Schneider’s support, we invited all the Seniors to pack a bag after we enjoyed our feast of Chick-fil-A Chick-N-Minis and frozen custard courtesy of Senior Parents. That day we packed another 292 bags, which Ms. Wilkins immediately delivered to a local school for distribution that afternoon. Our third and final packing day was on Dec 9 on the Landy Hall Deck. Upper School students from Advisory groups that remained on campus while others went shopping together for the Holiday Gift Drive lent a hand. We completed packing another 150 bags. Again, Ms. Wilkins delivered the bags to two elementary schools within 1.5 miles of our campus. All of the remaining donated items - 15 copier paper boxes full of crackers, granola bars, apple sauce cups, and fruit cups - were added to the Kind Mouse pantry so that they can keep packing and delivering until we get organized and do it all over again. Our next effort will be through the 2015 Spring Food Drive, which will be led by Freshman Cameron C. and his fellow participants in the Ready For Life Helpers group. They’ll collect during February and pack and deliver during Upper School Service Week, March 9-12. We are very grateful for the generosity expressed by the entire Shorecrest community, and sincerely hope that this project can be a year-round service activity involving all parts of our school community. It was hard enough to learn about the number of children affected by childhood hunger in our County, but it was even more shocking to learn that so many of those children attend schools within walking distance of our own campus. We were also able to donate 161 pounds of other food items received during the Fall Food Drive to the St. Petersburg Free Clinic’s Food Bank. We were also mindful about recycling all of the plastic and cardboard packaging that was generated from this project. We clipped a large number of Box Tops from the packaging that we plan to hand over to the Juniors/Class of 2016 with the hope that they will adopt the weekend food bag program next year (and maybe the Box Tops will help them edge everyone else out in the Homecoming Class Competitions for a win). Thank you to all who gave their time and donations to make the 2014 Fall Food Drive a huge success. We thank Ms. Wilkins especially for her tireless efforts as the “head mouse” of the Kind Mouse Nibbles Program, and for giving us the chance to be of service.